This is one of the most emotional moments I ever photographed during a wedding reception in the Floral Hall at at Toronto Botanical Garden. During the evening, after the bride and groom had their first dance, a choir of about 20 men appeared and started singing the most beautiful A Capella rendition of the song Stand By Me by BB King. Meanwhile, the groom asked his beautiful bride to join him on the dance floor. Usually the speeches during dinner are the most emotional part of a wedding during the song I noticed many of the guests weeping. 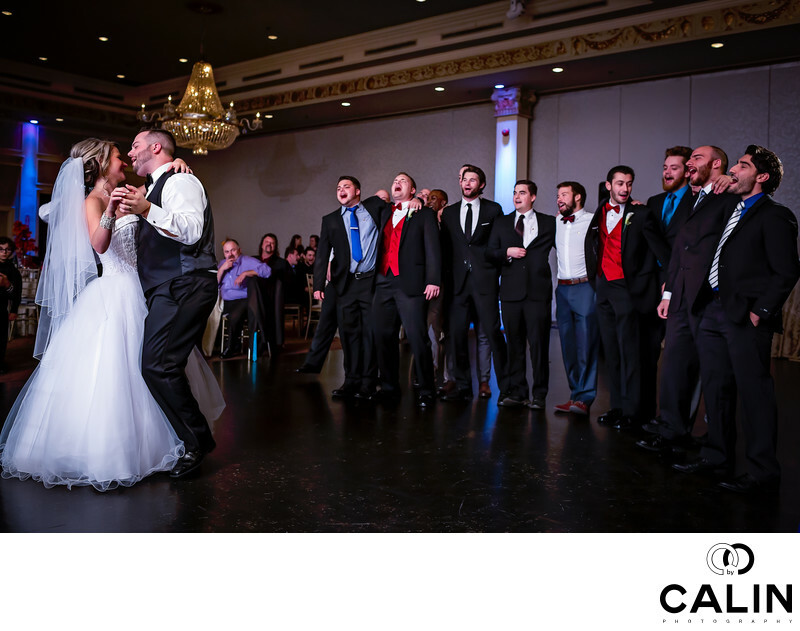 This image pictures the bride and groom on the left side of the frame doing a slow dance. On the right the man choir are performing for the newlyweds and everybody is enjoying the moment. In this shot, everybody is looking at the bride and groom and their gazes create virtual leading lines accentuating of the importance of the subjects in the photograph. To create this wedding picture I used a 35mm lens mounted on a 5D Mark III camera. In terms of lighting I took advantage of the beautiful ambient light of the venue and enhanced it by using a combination of continuous light placed on the bride and groom and flash used as a backlight to separate the subjects from the background. In terms of post production, I only applied a subtle burning of the edges of the frame to create an irregular vignette that draws the viewer's attention to the bride and groom.